My Envy Box of May 2016 Unboxing: What do you think? My Envy Boxes are pretty unpredictable. Sometimes I am happy. some times I am not and sometimes, I just cannot makeup my mind. Overall, in the last one year, I think they are catering good boxes. Moreover, I got introduced to brands I am now loyal to and without MEB, it wouldn't have ever happened. If you compare this years' box with last year's Box and the 2014 May Box improvement would be noticeable. I love this month's graphics! The February Box had the peacock design. Last year the August Box was grand in terms of design as well. And frankly, I have a thing for pictures! This month it couldn't get more tropical! The big banana leaves, the lotus, the tropical flowers, the orchids and most importantly the hornbill! I love hornbills! Did you know that hornbills can be found in Odhisa? I wish I could for once visit Simlipal and go bird watching. 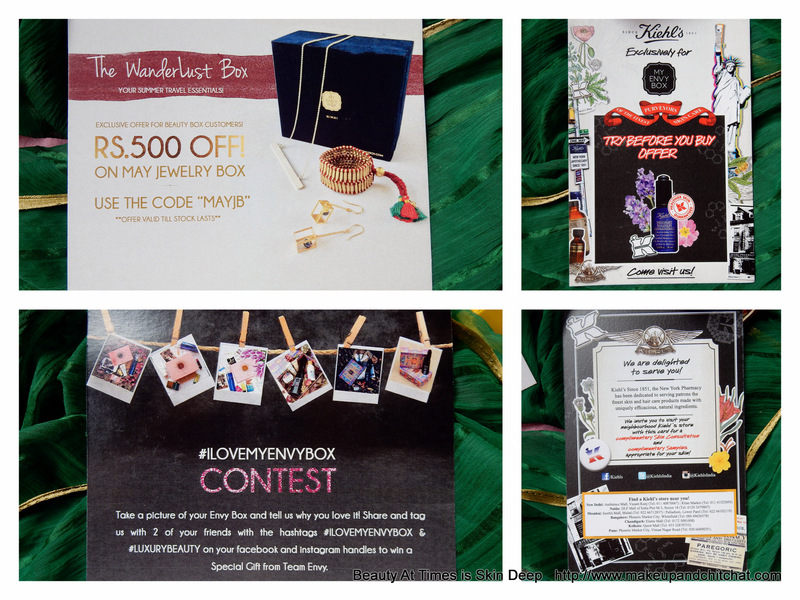 What's inside My Envy Box of May 2016? the dropper had completely squished and some scented oil had leaked out. I quickly took the bottle out and put it on a table. Through the next two days, whatever oil had leaked out was filling my room with a beautiful scent and it felt so calming. Island Kiss Lip Moisturizer Puerto Berry Blush ( Full size Rs 499/- 14 gm) : This is a full size and looks promising. Gulnare Handmade Skincare Seaflo Face Wash: ( Full size 120 ml Rs 350/- ) This one is a good size and I don't know if I should keep it aside for travel or start using it. Roots and Above Lemon Essential Oil (10 ml) Full size 50 ml Rs 375/- This is the one which delighted me! I found instructions of using it and I am going to give it a go. Votre Botanical Toning Mist. Full size 100 ml for Rs 800/-. In the box 50 ml: Since the weather is moody, the mist is most welcome. There's a Kiehl's Consultation Card and discount coupon of the jewelry box : Kiehl's has a 'try before buy' policy where you can get your skin consulted and try the recommended samples sufficient for a week or so before shelling out the big bucks. In Kolkata, the SAs are quite friendly. But, in case you feel uncomfortable about just walking in, the card might feel like your ticket. So, I do still appreciate it. Overall, although I did not find any 'luxury' brand per se, I still feel the box is value for money and for my part, I wouldn't regret. What about you? Did you like this month's MEB? In case you want, since discount coupons are not available on single month subscriptions, you can use the code 'CHITCHAT' for a flat discount of 10% for anything across the website, including one month subscription. The box was kindly sent to me for feature. This is not a sponsored post. I'm eager to know about the essential oil..lemon in this summer is cherry on the cake! Its disappointing that the products aren't luxury :/ Though the box is nice, the products within it don't seem worth the price. There are no luxury brands this time and all the products are from the drugstore.Thankfully I didn't order it as I dont like the contents so much.